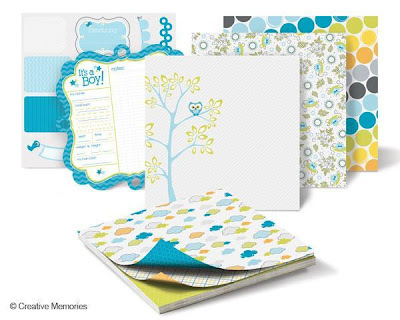 Life has been crazy and unfortunately for me (as for many of you) scrapbooking is often the first thing that gets put on the back burner when other things pop up. I never did get the SOTM up for April, so it has now become May's Sketch of the Month - and late in May at that! I am enjoying the challenge of coming up with layouts based on my easy 1-2-3 Formula...a layout that uses 1 piece of double-sided patterned paper, 2 pieces of cardstock and only 3 cuts! 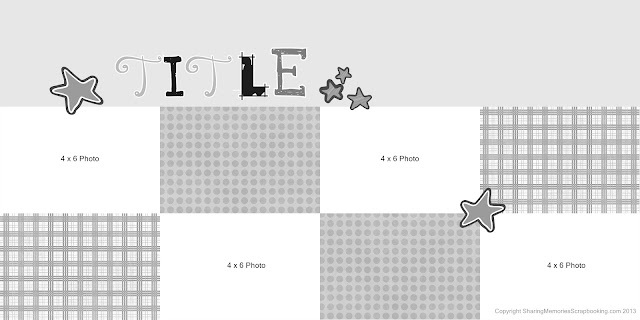 This month's sketch is a grid-style format with 4 x 6 photos interspersed with 4 x 6 blocks of paper. This is a great layout for using up a lot of 4 x 6 photos in landscape mode. I seem to have a lot of these because I often forgot to turn my camera to portrait orientation. The photos in my layout are from a car show we attended last summer and every single picture I took that day was in landscape orientation! I used two sheets of gray cardstock as my base along with one sheet of subtly patterned green/arrow striped paper from CM's It's a Boy! Stack Pack. I love this pack because it's not JUST for baby boys. The colors and patterns are so cool and can be used for so many different layouts (like with the cars above). Two pages of die-cuts are included in the stack pack and coordinating embossed cardstock, stickers and photo mats are also available. 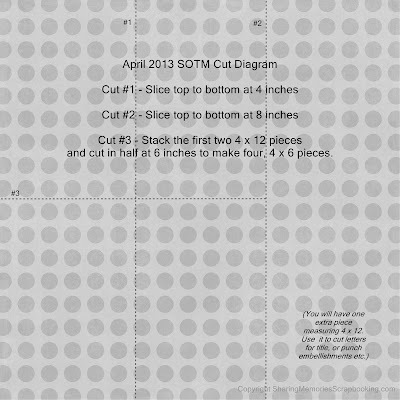 Here is the cutting diagram for the layout. After you make your three cuts you'll have a 4 x 12 piece of paper leftover that you can use to cut your title letters or punch shapes from. To complete my own layout I trimmed a couple of 1/4' strips from this leftover piece to add as a "ribbon" feature above the top row of pictures and paper blocks. Then I cut my title letters freehand after simply drawing them on the leftover paper and punched the stars with a retired CM punch. A few dots with my journaling pen echoed the dots on the patterned paper and polished off the layout. Remember, the magic of these 1-2-3 layouts is in the double sided paper...after cutting you simply flip over some of the pieces to perform double duty and add extra interest to your page. If you use the sketch to make a layout and share it on your blog, please include a link in the comment section below so we can see what you did with it! 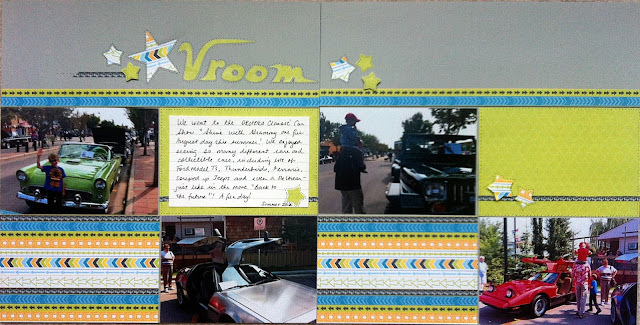 I hope you have some fun scrapbooking with this sketch this month! Your scrapbook examples are unique, love the simplicity.